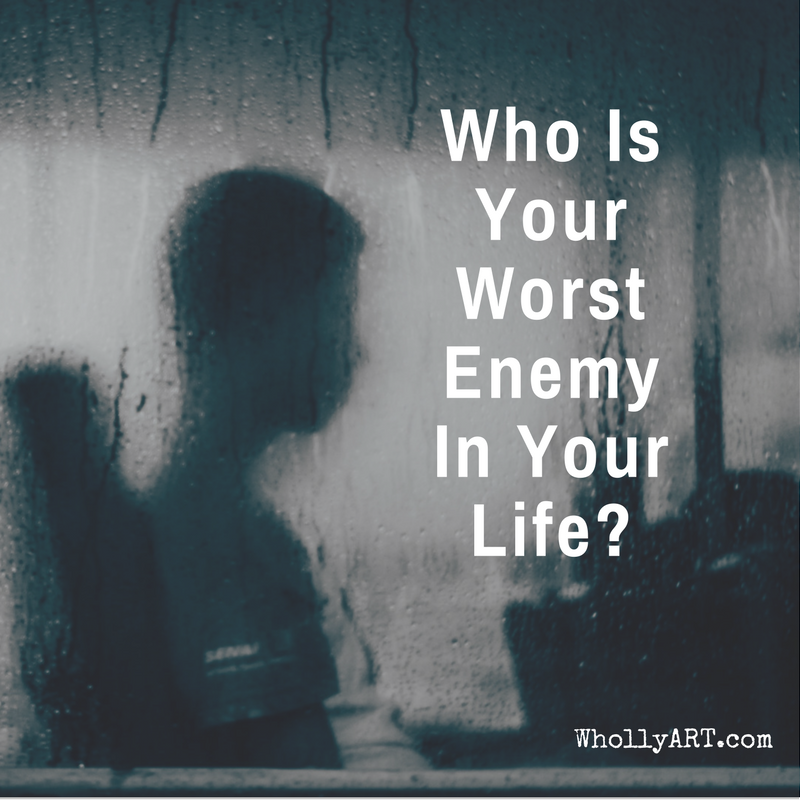 Who Is Your Worst Enemy In Your Life? Who is your WORST enemy in your life? I want you to ponder this question for a few seconds. What is the first thing that comes to mind? The school bully who’s always picking on you, your so-called friend who says mean things about you behind your back, etc. The little voice that convinces us we’re not good enough, makes us feel self-conscious, and constantly spouts negativity at us is what my mom likes to call the inner bully. He/She is our biggest enemy, because other people’s judgements wouldn’t really affect us if we didn’t actually believe them on some level. The worst part is that your personal worst enemy follows you around ALL THE TIME. I mean, just think about it: at least you can escape other people, but you live with yourself every second of the day. George R. R. Martin was right when he pointed out that,“The unseen enemy is always the most fearsome.” The damage we can do to ourselves is absolutely terrifying! Sometimes, the criticisms and “scoldings” we give ourselves are constructive and healthy, because if we didn’t have that natural instinct, we’d never learn NOT to make wrong choices. But even good things in excess are bad, because our criticism can take a nasty turn. Suddenly, we are convinced that our unwise choices are simply a result of how horrible we are. I know how this works because I deal with it on a daily basis. My own inner bully is at work 24/7, telling me I’m not good enough, that I can’t do anything right, or that I’m a horrible person. So how do we stop our inner bullies once and for all? Actually, we don’t! There will always be that little voice at the back of our heads, because let’s face it, we’re human, and we’ll all have those moments of self-loathing and utter disgust with ourselves. The first step to help with anything is awareness of what you’re going through. You name it, and you NEED awareness, whether it’s depression, grief, traumatic experiences, or physical illness. If you don’t know it’s there, there’s no working with it. So what do we do in the case of our mini worst enemy? Glad you asked! It is crucial to notice it. Most of us are unconsciously listening to the voice in our head, and it plays in the background all day, jumbled up with all our other thoughts. After you have made a habit of noticing your little bully, you can start isolating those negative thoughts, and come to understand this fact: THAT IS NOT YOU. It may be confusing, but those thoughts of sadness and anger are not who you are. If they were, you’d be fighting against yourself, and everyone knows that would be a losing battle. But you’re not choosing between two parts of yourself, you’re simply rebuking the voice that was never meant to be there. Make a habit of correcting your little guy. Whenever it says something negative about you, REFUSE to believe it and ask yourself, “Where is the evidence?” And there will never be any, because it’s not true. After that, choose to disagree. Talk back. Argue. Ignore it. Disobey. And DON’T LISTEN. 4 – LAUGH IT OFF! Have you ever heard of the advice that if you stop reacting to someone who teases you, they’ll get frustrated because they live for your anxiety? Well, the inner bully is like that, too. Instead of getting angry, depressed, or flustered, treat the voice like a small, ignorant child. Say, “OK, you can move on, now. I’m sorry, but you’re just not going to get anything from me.” And laugh. At yourself and at your worst enemy. Starting today, listen carefully to you’re listening to in your mind. Become aware of all the uneccesary negativity in your mind, and just like you dump someone who uses you, BREAK UP with your inner bully. Give them the divorce papers and skip away.